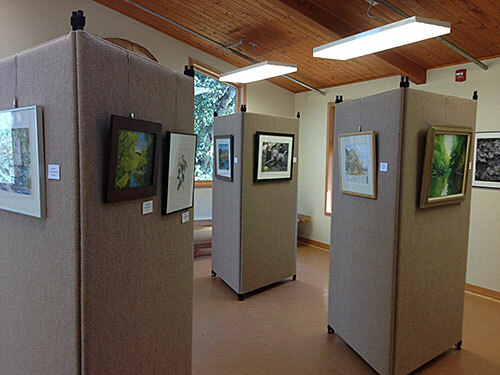 An exhibit of Carmel area artists' artwork depicting the Carmel River Watershed now on display at the Garland Ranch Visitor Center. (Photograph: Rita Dalessio). An opening reception for local artists' renderings of the Carmel River watershed opened on January 10 showcasing 2-dimentional media depicting plants and animal life in and on the water. This juried show is a must see for anyone interested in the riparian corridor of the River which connects several MPRPD parks from the inland upper reaches of Cachagua Community Park heading down stream connecting Kahn Ranch running westward through Dampierre Park. The River continues, reaching Garland Ranch Regional Park and Palo Corona Regional Park overlooking the Carmel Lagoon where the River spills into the Pacific Ocean. The Garland Ranch Regional Visitor Center in Carmel Valley is a destination that provides an opportunity to experience the Carmel River Watershed and serves as a gateway to exploring your parks and open spaces. The art exhibit will run through June 25, 2015. For more information and hours please call MPRPD at 831-372-3196 or visit: www.mprpd.org (Source: MPRPD staff).